Fanny Mills was born in England in 1860, and eventually emigrated to America to settle with her parents in Sandusky, Ohio. At an early age, Fanny began to show signs of Milroy's Disease — a form of lymphedema that causes excessive build-up of fluid in the lower extremities. This was the source of Fanny's prodigiously large feet, which were said to require “size 30” boots, each of which were constructed from the skin of several goats. For socks, Fanny is said to have used pillow cases. Fanny Mills began exhibiting herself on the dime museum circuit in 1885. The Ohio Big Foot Girl was unable to walk without assistance, so Fanny was accompanied by her nurse Mary Brown. As a publicity stunt, the deed to a farm and a cash prize of $5,000 was offered to any gentleman willing to marry her. Fanny attracted many suitors (each of whom paid the admission price for the privilege), but Fanny was already married to William Brown, the brother of her nurse. Due to failing health, Fanny retired with her husband to Ohio in 1892. She died later that year. 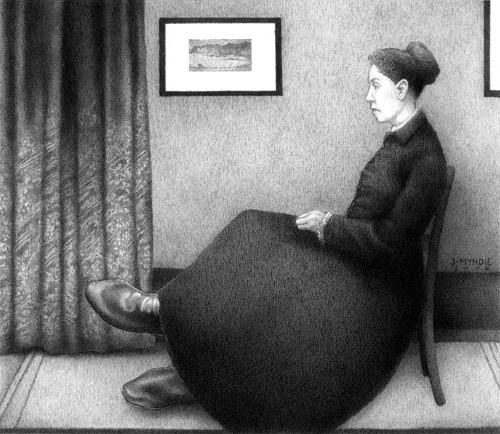 This drawing is based on Fanny's pitchcards and James Abbott McNeill Whistler's famous painting Arrangement in Grey and Black No. 1: Portrait of the Painter's Mother (1871, Musée d'Orsay), popularly referred to as Whistler's Mother.